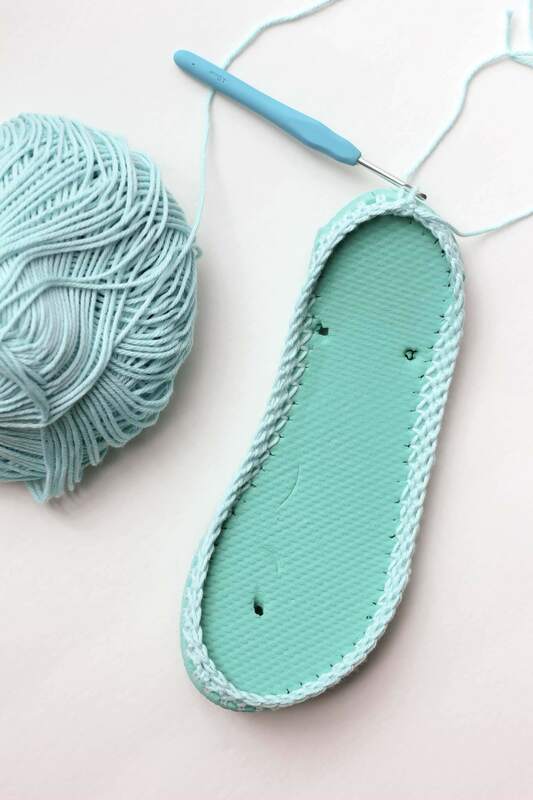 Crochet Slippers with Soles -- Free Crochet Patten Using Flip Flops! 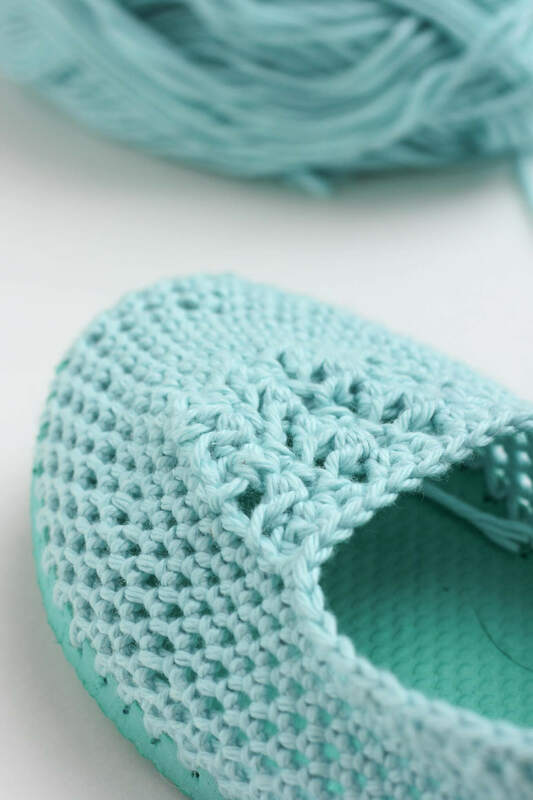 Cotton yarn and flip flops combine to make super comfy crochet slippers with soles in this free crochet pattern! These are perfect for warmer weather too! 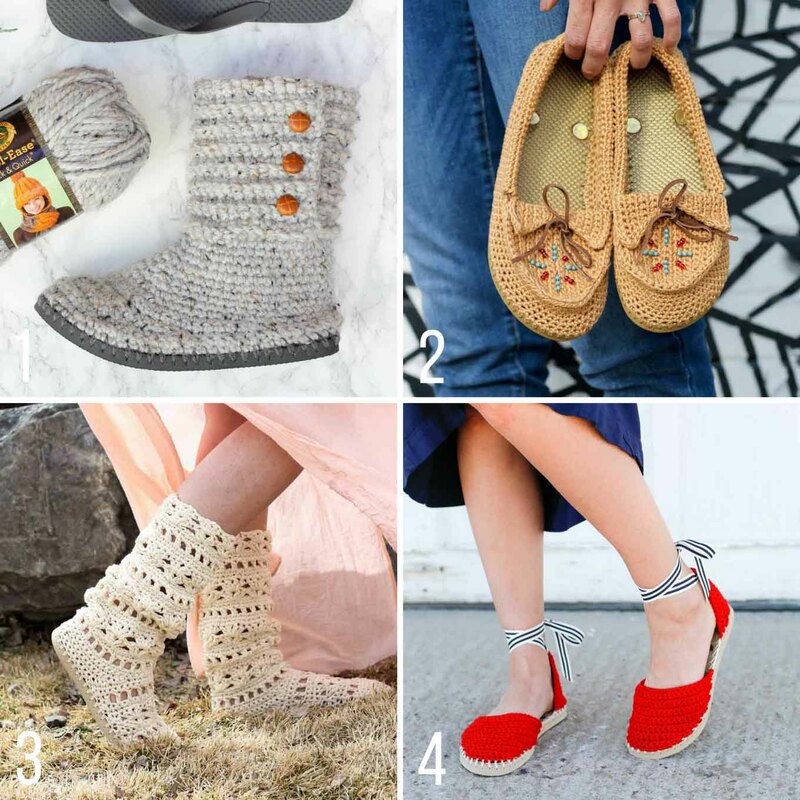 And you now can find all my additional free crochet patterns using flip flops here! 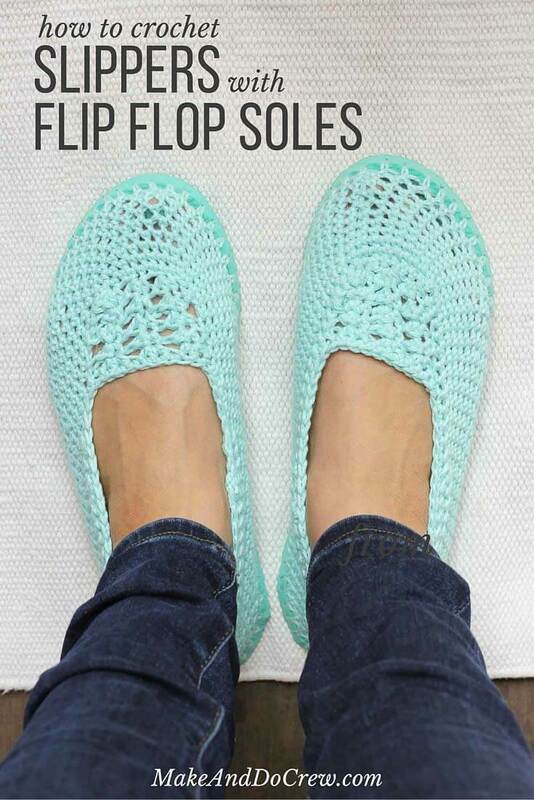 UPDATE: Many readers have asked how these crochet slippers with flip flop soles hold up over time. I’ve answered that question (with photos!) 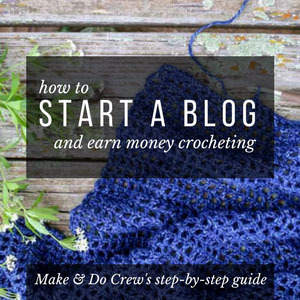 and many more in my FAQs about crocheting on flip flops. • This isn’t an exact science! 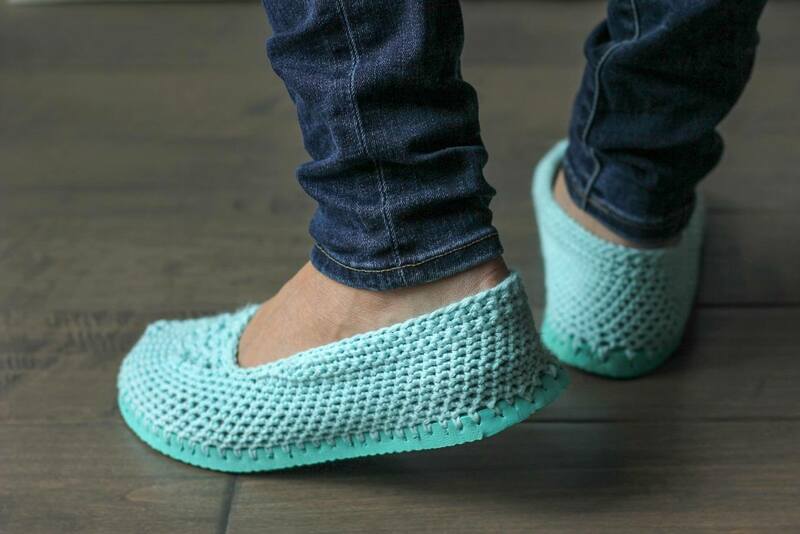 Unlike other patterns, these slippers have a lot of variables, most significant of which is the size of flip flops you use and the number of holes you poke. I’m providing general guidelines and some troubleshooting tips to help keep the process fun. 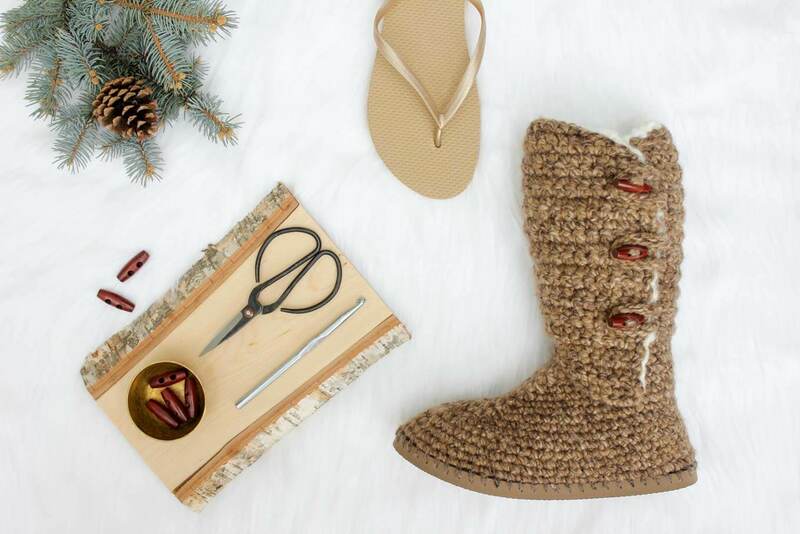 For guidance on the techniques used, you can check out the video tutorial for these sweater boots with flip flop soles. • The slippers pictured are about a women’s size 9. I poked 69 holes in the sole of each flip flop for this size. 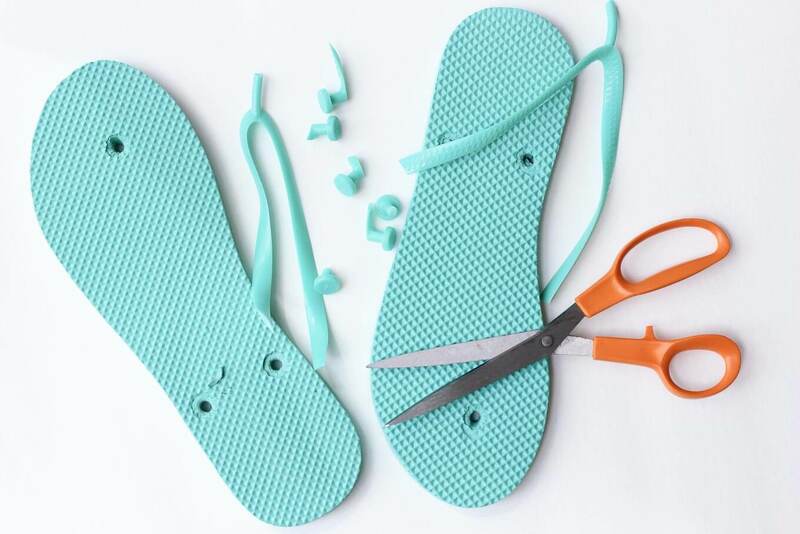 To make slippers with bigger or smaller flip flops, just adjust the number of holes, poking them about every ¼ inch. The slipper top pattern should fit most women’s sizes. If you’re making a significantly bigger or smaller size though, you could work fewer or more rows of the slipper top pattern and even add a row or two to the sides/heel section to make it taller. • Find $1 flip flops on Amazon or at Walmart. I’ve tried Dollar Tree’s $1 flip flops and the rubber is a bit too flimsy for this. • Similar to some ballet flats, your slippers should curl in a bit. That’s what gets them to shape to your feet without a lot of increasing or decreasing. 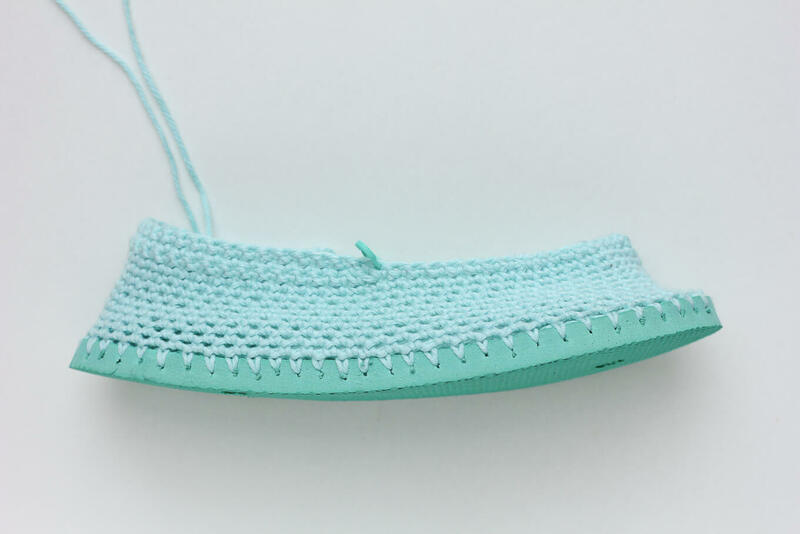 If you’re finding that the crocheted sides/heel/toe isn’t tapering in, it might be because you have more holes in the flip flop than are necessary (and therefore more stitches total). 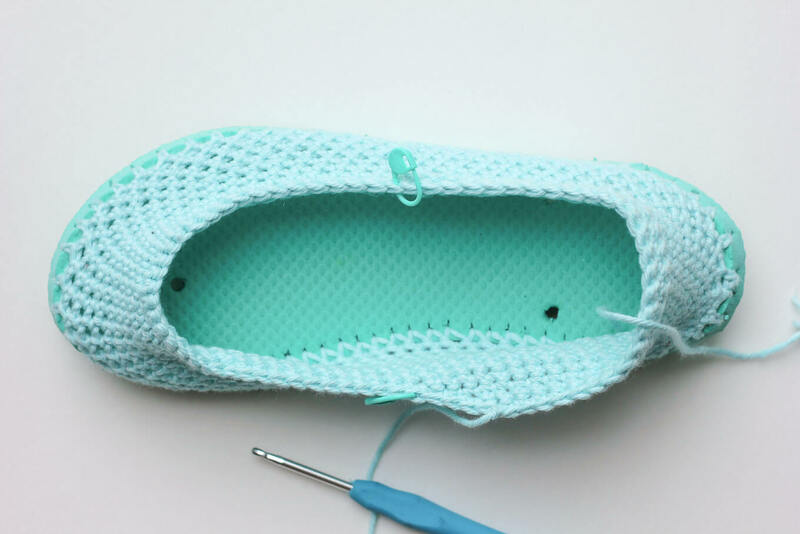 In this case, use a smaller hook or do a few sc-decreases on row 3 or 4 near the toe and heel to decrease the number of total stitches. If you’d like to purchase an ad-free printable PDF of the updated pattern for $2.50, you can do so by clicking here. 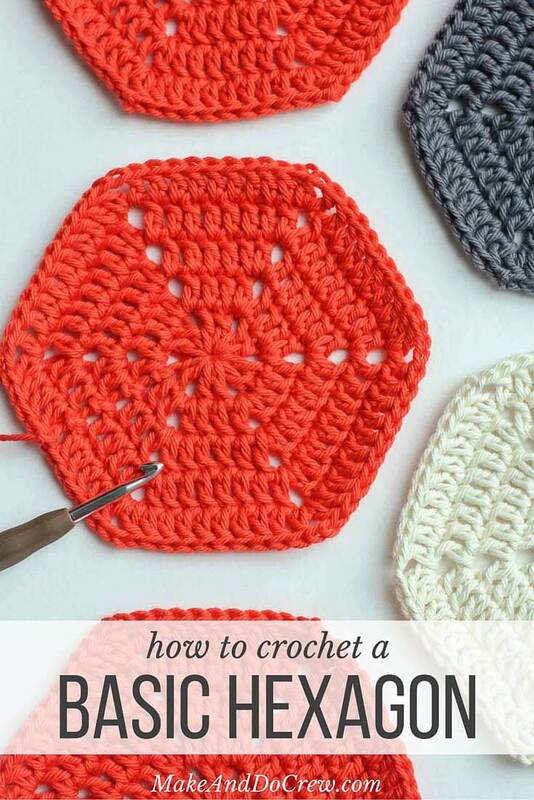 Perfect for crocheting on the go or mobile viewing! 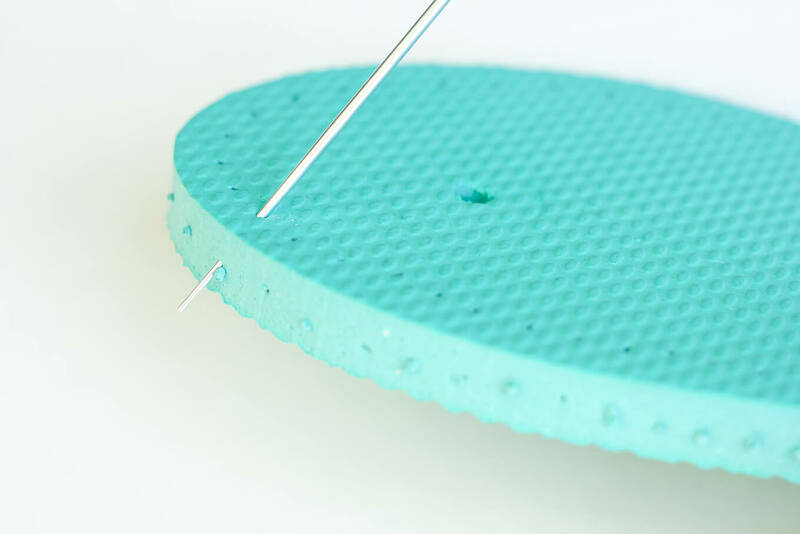 Using your sharp instrument, poke holes every 1/4 – 1/3 inch around each flip flop sole. You want the hole to go at an angle from about the middle of the way down the sole to about a ¼” into the top of the sole. It’s important to make your holes far enough from the edge that the yarn won’t rip through the rubber when you create your first row of crochet. Round 1: Using smaller hook, sc in each hole around sole. Do not turn. Place marker in first st of round and move it up as you work each round. Remove marker. Place stitch markers opposite each other in the middle of each side of the last round. This is where the back heel “lip” of your slipper will taper to. Row 10: Ch 1, sk first sc, sl st in next sc, sc in each sc until 1 st remains before next marked st, sl st in next sc, turn. Row 11: Ch 1, sk first sl st, sl st in next sc, sc in each sc until 3 stitches remain before next marked st, sl st in next sc, turn. Row 12: Ch 1, sk first sl st, sl st in next sc, sc in each sc until 3 stitches remain before next marked st, sl st in next sc, turn. Round 13: Ch 1, sk first sl st, sl st in next sc, sc in each sc around entire slipper, past where this round started, until you reach the center back of the heel, sl st in next sc. Fasten off. Position flip flop with the toe toward you and the heel away from you. Find the approximate midpoint of the front of the slipper. Place stitch markers at the toe “corners” with 11 sc between them. Reference chart below for visual schematic of slipper top. Row 1: With the toe facing toward you, sl st in first marked st, (sk 2 sc, cluster in next sc) 3 times, skip 2 sc, sl st in next marked st, sl st in next sc of Rnd 13 (up left edge of slipper), turn. Rows 2-4: Cluster in center hdc of each of next 3 clusters, skip 1 sc in Round 13, sl st in next 2 sc of Rnd 13 (up right edge of slipper), turn. Row 5: Cluster in center hdc of each of next 3 clusters, skip 1 sc in Round 13, sl st in next 1 sc of Rnd 13. Do not turn. Round 6: Sc in each sc around entire slipper until you return to where you began this round. Fasten off. Repeat pattern with second rubber sole. Weave in ends. 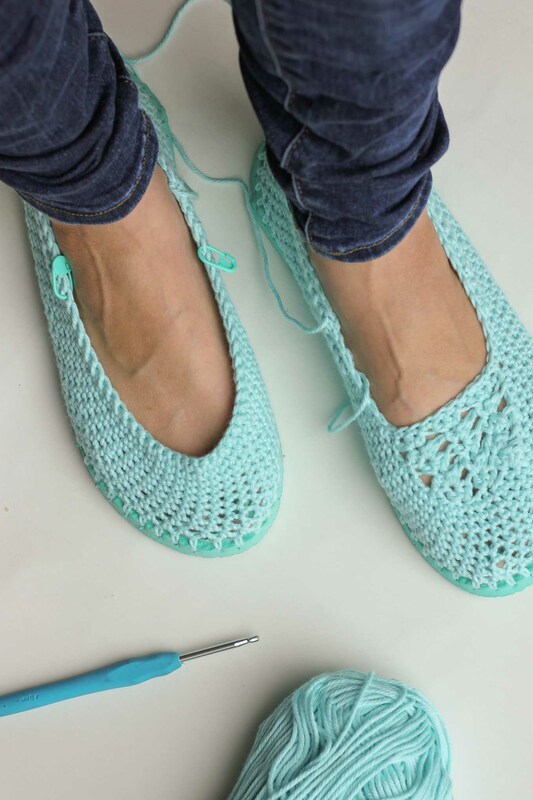 Tap your toes together, smile and run around your house like I did because you just made your own crocheted house slippers! 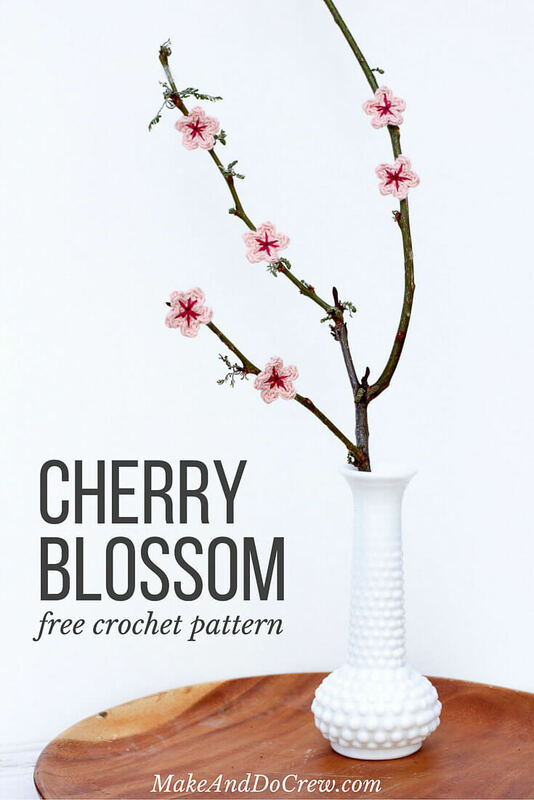 If you’re looking for more free crochet patterns that won’t get you all sweaty this summer, give these a whirl! Love them! This pattern was super easy to follow! I learned my lesson too about buying cheap flip flops, bought a $0.99 pair from Micheal’s and they were far too flimsy to crochet into. Old Navying haso flip flops 2 for $5 so far ON flip flops have proven to be the best for crocheting to. I’m so glad you had success with Old Navy flip flops. Those have been my favorite as well. I also like that they have so many color options to choose from! PS. Old Navy has a $1 flip flop sale going on very soon. Perhaps it’s next weekend? I need to look it up! Jess, Great Website!!!!!! 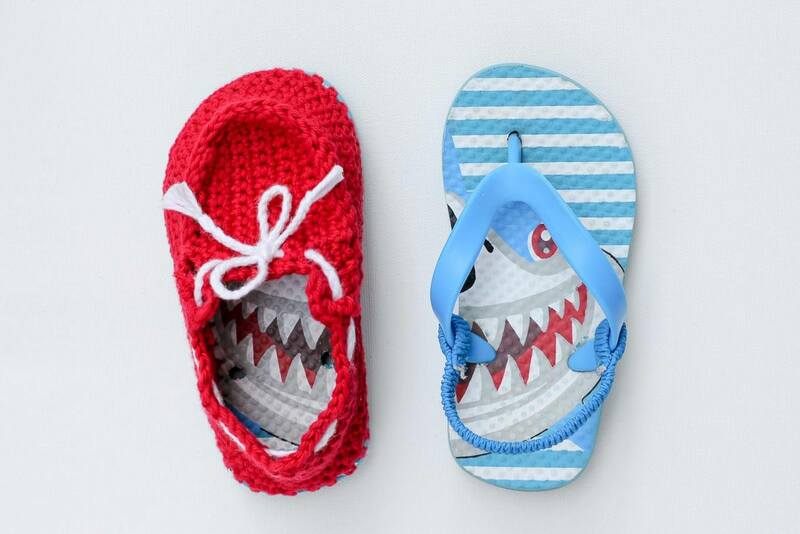 Love the ideas you have for using the flip flops. where do I find the tape to mark the holes in the flip flops? hi, i would love these patterns, but i don’t have access to my own printer, but would be glad to have you send me the printed out patterns, i would gladly pay foe them. I paid for the download for the measuring tool for making the holes in the flip flops, but I can’t seem to download it. I have the invoice number 1600060398 and when I try to download it just keep going to ‘blank page.’ I have Adobe. It should work. I would love to share this at a Prayer Shawl Retreat. If I give you credit (keep the links) can I share this at the retreat? Yes, please do! I’d love that. Thanks Carol. Have fun!